Responses to the proposed "Charter of Quebec Values:"
2013-SEP-03: Amira Elghawaby is the Human Rights Coordinator at the National Council of Canadian Muslims (NCCM). In her op-ed piece in the Toronto Star newspaper, she views the proposed Charter as a document to unify the "pure laine" in Quebec. This term is French for "pure wool" and a common phrase that refers to people in Quebec whose ancestry is purely French-Canadian. A similar term is "de souche" which means "old stock." "... actually more than just a jab at the religious minorities who helped build the province. It is, in fact, a jab at our entire Canadian identity (an added boon for the Parti Québécois). As authors and historians have pointed out over the years, our evolution into a multicultural and generally welcoming space has a lot to do with aboriginal values. In his 2008 book, A Fair Country, 1 philosopher and author John Ralston Saul argues that First Nations culture permeated relationships, despite some concerted efforts to stamp it out. Concepts around shared governance, community and inclusiveness managed to infiltrate the highest echelons of power in this country, perhaps even leading indirectly to the embrace of an official multicultural policy in 1971, a policy that became and remains admired around the world and which has attracted the best and brightest minds to our shores. Further, Saul recognized a phenomenon that once again appears to be rearing its head, with Quebecers at the forefront of this unfortunate turn. He might as well be writing about today’s Quebec. Polls favouring the proposed charter indicate that [Premier] Marois has tapped into a visceral paranoia of the 'other' that sometimes haunts communities to tragic effect. "The whole notion of reasonable accommodation is a violation of normal democratic values. By its very nature it gives a majority more rights than a minority. It puts minorities in a position of having to act in a way that the majority finds acceptable. Aside from head coverings let's remember the row crated by Muslims not eating pork in a cabane a sucre. It created quite a fuss because it was not in accord with Quebecois values. This law which seems to have a lot of support in parts of Quebec is something to be deeply ashamed of. It certainly will confirm Quebec's unique status: anti-democratic, racist, discriminatory. Not something to be proud of, but as Marois said upon being chosen as leader of the PQ, "we should not be afraid of what others think of us." " 'We should not be afraid of what others think of us...' Really ! Most of the human race do care what others think of them. if we have a 'Moral compass' and we step over the line I hope that civilisation does step up and tell us: 'We have crossed the line' on civilised behavior ! it [is] not only necessary, it the right thing to do." "First of all is this topic really exists . Can PQ change the person's religion.This party knows that it does not have support from any other sect than only some narrow minded people." 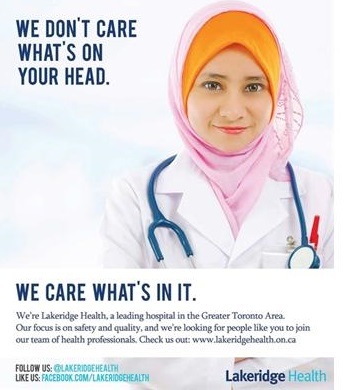 2013-SEP-13: Lakeridge Hospital in Ontario recruits medical professionals from Quebec: A hospital in the Toronto, ON area took advantage of the pending restriction on religious clothing to raid Quebec hospitals for doctors and nursing staff. 29% are "old-stock Catholics" who are concerned about what they perceive as the negative effects of immigration. 21% are "closed secularists" who oppose any display of religion in the public space. 29% are "tolerant believers" who have no problem with religious diversity in Quebec.